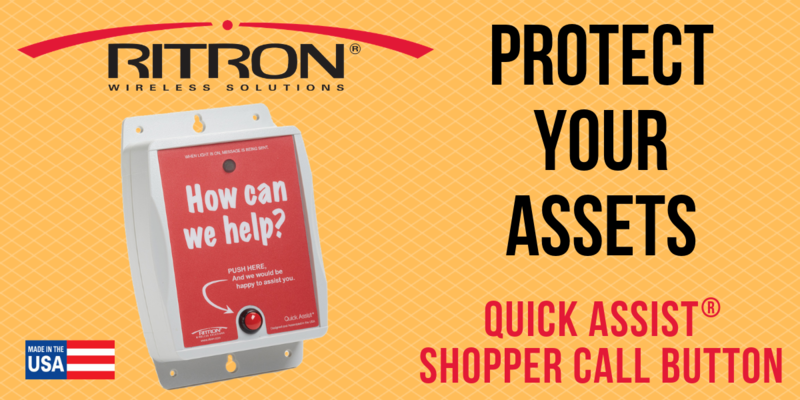 Retail Loss Prevention - How Does The Ritron Quick Assist® Shopper Call Button Play A Beneficial Role? The Quick Assist Shopper Call Button aids in preventing loss by allowing retailers to be confident that sales levels will not decrease for high value items displayed in a locked display case or behind a non-staffed counter. While studying recent sales and loss reports, the manager notices that losses of certain high-value merchandise have increased. Pinpointing the losses to an area of unsecured merchandise, the manager orders that product category be secured in a locked display case. While losses are drastically decreased, sales also decrease on this category since the locked merchandise requires interested customers to find a sales associate for assistance - and the sales staff is often assigned to other areas of the store. This is when the loss prevention manager seeks out a solution to this problem. Enter the Ritron Quick Assist Shopper Call Button installed at the locked display case, standing by ready to summon a nearby sales associate to take care of the interested customer. Customers may now quickly access a staff member when purchase intent is high by simply pressing a button to call for assistance. Instead of losing that customer, a pre-recorded custom message is sent over the radio network to sales associates trained to respond quickly to the call for assistance. The radio-equipped associate assigned to monitor that area quickly responds, or uses the radio network to call upon another sales associate to take care of the customer. Since the trade off is that sales volume will decrease when high value items are locked in a display case, the loss prevention manager now uses the Quick Assist callbox wherever high value merchandise is secured. How big a problem is loss prevention to retailers? The biggest factor in shrinkage among U.S. retailers, the study found, is external theft / shoplifting, which accounted for 35.6% of all lost sales last year. Internal factors, such as employee theft, accounted for 24.5% of losses. Administrative errors and return fraud account for the remainder of losses in retail.